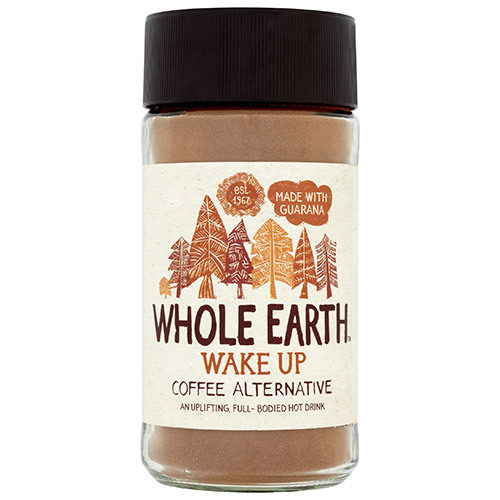 Whole Earth Wake Up Coffee Alternative is made with delicious, natural ingredients including barley, figs, chicory and a dash of guarana. Sip, savour and contemplate your day with a renewed fervour. Barley (36%), malted barley (26%), chicory, rye (10%), figs, guarana (4%). Sprinkle 1 or 2 teaspoons of Wake Up Coffee Alternative into your favourite cup and add freshly boiled water. Add milk if you like and sweeten if you fancy it. High caffeine count (18mg/100ml). Not recommended for children or women who are pregnant or breastfeeding. Below are reviews of Whole Earth Wake Up Coffee Alternative - 125g by bodykind customers. If you have tried this product we'd love to hear what you think so please leave a review.